Police Deploy Armored Vehicles, Tear Gas Against Paris Protesters; Hundreds Detained Protesters took to the streets of the French capital on Saturday in the fourth demonstration since unrest began in November. Tear gas was hurled as protesters, known as yellow vests, took part in a fourth demonstration in Paris on Saturday. The streets of Paris were filled with thousands of protesters again on Saturday, in what has become French President Emmanuel Macron's biggest challenge as demonstrations grow more intense. 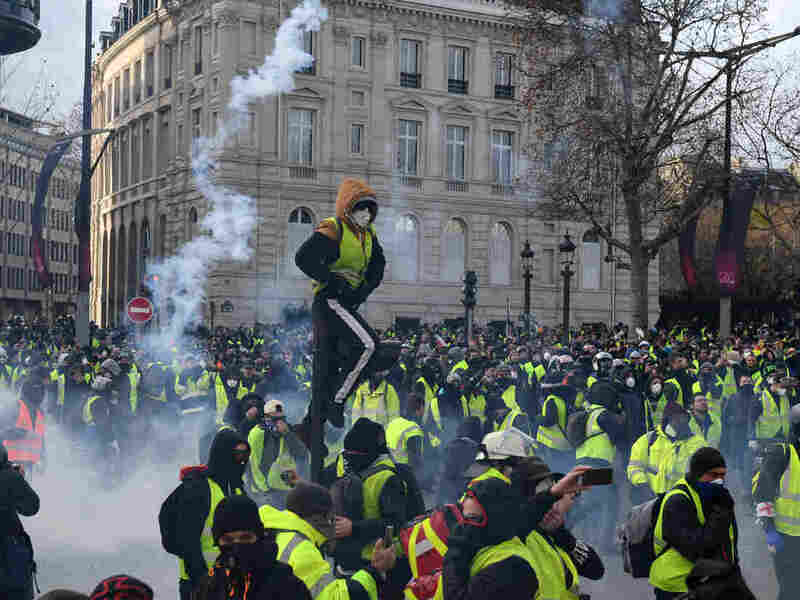 It's the fourth rally by the gilets jaunes, or "yellow vests," protesters wearing the fluorescent jackets required by French law to be in every vehicle. The unrest started in November, spurred by anger over Macron's controversial hike in gas taxes, which were meant to reduce the country's reliance on fossil fuels and to mitigate the effects of climate change in accordance with the Paris climate agreement. Over three weeks, the demands of protesters have expanded to include a raise in the minimum wage and a decrease in the retirement age. The rallies have also attracted anarchists, nationalists and extremists on the far right and left, resulting in deaths, injuries, vandalism and looting. On Saturday, armored vehicles rolled through cobblestone streets in the French capital; it is the first time in years that police resorted to that tactic to handle protests, NPR's Jake Cigainero reported. About 8,000 police officers were on the ground in Paris – nearly twice as many as last week. They made hundreds of preventative arrests, following orders to engage with and remove violent demonstrators instead of avoiding direct confrontation as they did last week, NPR's Eleanor Beardsley reported. Near the Arc de Triomphe, police fired tear gas grenades and water cannons to push back demonstrators. Instead of retreating, protesters moved closer once the smoke cleared, and the scent of tear gas wafted through the streets. Video showed protesters being searched by law enforcement for objects that could be used in battle. More than 1,300 people were taken into custody, Beardsley reported. Some masked protesters torched barricades and threw rocks in the Grands Boulevards shopping district, Agence France-Presse reported. Across the country, as 89,000 police officers were said to be deployed, protests also cropped up on roads, congesting main transportation routes. Patrice Hubert, a Paris resident who brought his son out to watch the protests, told Beardsley, "We want to understand the people who are still demonstrating. Are they the core ones or are they agitators?" He said he hoped that Saturday was the last day of demonstrations, adding that it amounted to "a crisis of identity." Macron, he said, "is not strong enough. The shoes are too big for him." Macron's government offered a concession this week when it announced that it would scrap the planned rise in fuel tax. But the president's reputation has continued to suffer during the countrywide rallies. Protesters accused Macron of being out of touch with working people and shouted for his resignation on Saturday. They carried signs that read "Non-non a Macron," or "No, no to Macron." By Saturday afternoon local time, at least 50 people were reported wounded, including three police officers and an Associated Press video journalist, according to the AP. "We were on our knees, and they shot tear gas at us," Yanis Areg, a 21-year-old from the Paris suburb Montfermeil, told Reuters. "I am telling you, things are going to blow up tonight." French Interior Minister Christophe Castaner told reporters that the last few weeks of protests had "created a monster that escaped from its creators." Anticipating chaos on Saturday, some yellow vest groups warned their members not to go to Paris. Police ordered stores, museums and tourist destinations like the Eiffel tower to close, out of fear of a repeat of last weekend's riots. Shopkeepers and café owners near the Arc de Triomphe used plywood to board up their windows. Thierry Stapts, the owner of a high-end motorcycle accessory shop that was looted last week, told Beardsley that Saturday could be worse. "They have some time to prepare," Stapts said. "Every week they prepare, so every week you have more and more people who want to break." In Belgium, at least 100 people inspired by the yellow vests demonstrations in France have been detained. Protesters hurled stones and firecrackers as they marched through Brussels. Belgian police shot back with tear gas and water cannons. President Trump commented on France's unrest on Saturday, suggesting the demonstrations proved "The Paris Agreement isn't working out so well for Paris," he tweeted. "Protests and riots all over France." Protesters told NPR that they largely support the global climate pact — they just don't think the poor should bear the costs. A previous version of this story misspelled Patrice Hubert's name as Patrice Habrrt.